If you have been following new, exciting African poets, you have surely heard of Warsan Shire. My introduction to her poetry came in 2013 when she became the inaugural winner of the Brunel University African poetry prize. I had applied to that prize so I followed it keenly. Also, the fact that it was an African poetry prize initiated by Bernadine Evaristo “to draw attention” to poetry from Africa, gave me more than a little joy. Warsan has moved on in leaps and bounds since winning that award. Warsan Shire was born in Somalia in 1988. She became popular in 2011 when her poem “For Women Who Are ‘Difficult’ to Love” (video with voiceover by Warsan) went viral. She moved to London with her family when she was still young and has traveled extensively for her poetry. Warsan’s poetry is very simple yet very deep. Many of them, if not all, portray a woman who is fundamentally feminist. I have tried on countless occasions to review a poem of hers but much of her poetry’s depth makes it difficult to do full justice. She is the first poet I will review, whose poetry came to me as so beautifully difficult and this work is one of the easier ways to introduce her to anyone who has not read her work. It has taken a couple of days to decide on which of her works I can comfortably review. Not to be taken wrong, her poetry is very simple to read on the face but when you try to review, to interpret or to translate, you find that you are dealing with layers, layers and layers of meaning and thought. She became the first young poet-laureate of the city of London in 2013. 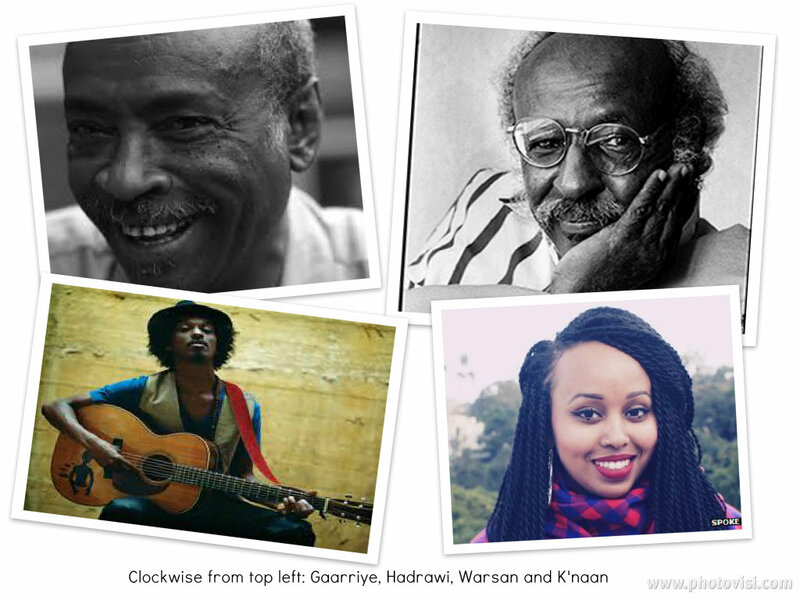 In my previous post about the depth of Somali poetry, I have reviewed her in the same lights as Hadraawi, Gaarriye and K’naan; the first two, classical, the latter two contemporary poets in a glittering Somali poetry culture. Read here my review of The Kitchen published in 2011 by Flipped Eye in her chapbook with the title Teaching My Mother How to Give Birth. The title and setting of this poem by Warsan are a sort of deflection from a deeper story that is woven throughout the poem. How many great poems have been written about kitchens and cook books? I have seen few. But as the poem opens, your mind is cast unto delicacies of the palate, what with ‘Half a papaya and a palmful of sesame oil’ (line 1). In the second line, the poet sharply turns to address a woman whose ‘husband’s mind has been elsewhere’. The third line, like a forgetfulness of the second and a reminder of the first, tells of ‘Honeyed dates, goat’s milk’, before it continues to address our woman in line 4 about her wanting to ‘quiet the bloating of salt’. Our addressed woman’s husband has come to or has always been in the kitchen because in line 6, he kisses the back of her neck at the stove and in line 8, she offers him the hollow of her throat. 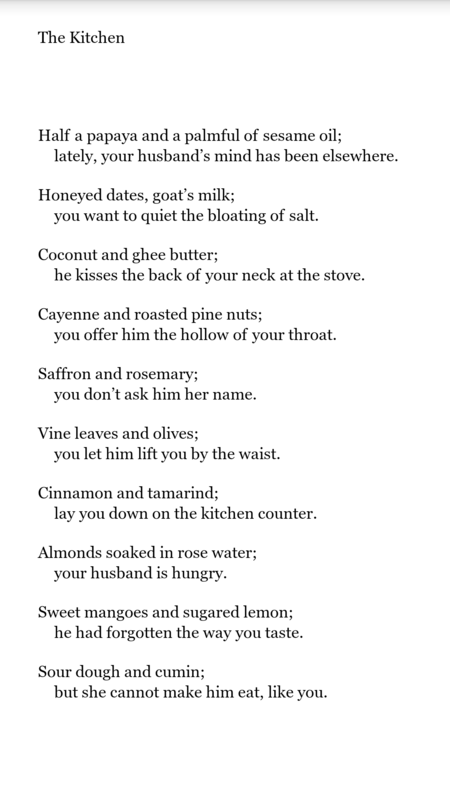 There is some romance going in the kitchen interspersed with the preparation of what sounds like a coming romantic dinner with coconut and ghee butter (line 5) and cayenne and roasted pine nuts (line 7). In line 10, Warsan gives us a hint of our woman’s suspicions; she has decided that her husband is seeing another woman but she doesn’t ‘ask him her name’. She lets him lift her by the waist (line 12) and lay her down on the kitchen counter (line 14). The melody of food continues interwoven with this woman’s story like a story sandwich with a hint of saffron and rosemary (line 9), vine leaves and olives (line 11), cinnamon and tamarind (line 13). The poem winds down and the woman is told her husband is hungry (line 16). He had forgotten the way she tastes (line 18) but upon all his infidelity and wanderings, his other mistress could not and ‘cannot make him eat, like you’ (line 20) his wife. There’s some intertwining in these last lines that makes the poem endlessly complete. The man is in the kitchen because he is hungry. In the kitchen, he does not taste the woman’s food but seeks out pleasures of her body. He has forgotten how the woman tastes, not her food. The other woman could not cook him a better intimacy than his wife does and that is why he is back to his wife, whose ‘food’ is better. The fact that this poem takes place in a kitchen is just a subtle cover for something deeper that brewed underneath – underneath every line of this poem that reads food, every line staggered away from the edge of the page like an afterthought. Do one thing for me before you’re through reading this review. Go back up and read every even-numbered line of this poem only. Forget the first lines and read the second line of each couplet. That is the story Warsan has been trying to tell us. Beautiful poem, isn’t it? Edit: This post is quoted here on The Guardian UK. Undoubtedly among the best, published poets of the young African generation, Warsan Shire (@warsan_shire) has lent her voice to a campaign by The Guardian to push for education on Female Genital Mutilation in UK schools. The campaign is championed by 17-year old Fahma Mohamed and supported by anti-FGM campaigners. I’m sharing the text and a link to the video here because I believe that FGM must be stopped everywhere it occurs and as an ardent proponent of African poetry, these are the ways the campaign ring with me: through the art. Warsan Shire won the inaugral Brunel Poetry Prize last year and one of her winning poems, Things We Had Lost in the Summer, is drawn from her experience of growing up in a community of people who have undergone the procedure. This latest poem, Girls, recorded for The Guardian, touches FGM in ways that you may probably never had heard: makes it soft but ragingly powerful and real, brings it to a home setting, puts it on a TV reality show, puts it beside you on your bed, talks to your mother, alludes to the devil’s tongue! I have been a great admirer of Warsan’s work and this adds to the increasing body of powerful poetry she’s challenging the world with. All the world needs to act to ensure FGM doesn’t continue into another generation. The last woman to have suffered it should be the last. We are all responsible and accountable. Copyright for the text belongs to Warsan, credit to Spread The Word for the text. Watch the video performance by Warsan Shire here on the Guardian site. Sometimes it’s tucked into itself, sewn up like the lips of a prisoner. After the procedure, the girls learn how to walk again, mermaids with new legs, soft knees buckling under their new stainless, sinless bodies. Daughter is synonymous with traitor, the father says. If your mother survived it, you can survive it, the father says. Cut, cut, cut. On a reality TV show about beauty, one girl exposes another girls’ secret. They huddle around her asking questions, touching her arm in liberal concern for her pleasure. Can you even feel anything down there? The camera zooms into a Georgia O’Keefe painting in the background. But mother did you even truly survive it? The carving, the cutting, the warm blade against the inner thigh. Scalping. Deforestation. Leveling the ground. Silencing the devils tongue between your legs, maybe you did? I’m asking you sincerely mother, did you truly survive it? Two girls lay in bed beside one another holding mirrors under the mouths of their skirts, comparing wounds. I am one girl and you are the other. For a couple of months, I have been drawn to poetry coming from Somalia and the reason is simple; Somalis are a people who are faced with daily struggles that many African countries have already gone through at independence. For many countries in sub-Saharan Africa, much of our best poetry and most-studied poets were born in the pre-independence era, writing their struggles and pouring their hearts in the art. The world has branded Somalia the most failed state but for us in the arts, we had better recognize Somalia for the gold-mine it is when it comes to poetry and general literature because really, Somalis are in that phase that births literature with heart. Somalian script existed before the Arabic conquest. At this link, you can see a picture of an early tablet which indicates Wadaad writing of the Somalis. Omniglot explains and illustrates further here. In history, Somalia stands with Egypt, Sudan and Ethiopia as the early-settled and most historically-relevant countries in Africa. Somalia has some of the earliest pyramids. Let me not digress to history. I’m celebrating Somalian art. Long ago in 2010, I listened to K’naan do the World Cup theme song and was pleased to know he was from Somalia. Because traditional media does not hype the art side of Somalia, I thought K’naan may have been a rare breed of Somali who probably had no connection to the country from infancy. Don’t listen to what they tell you in the news. K’naan is a poet who grew up until 13 years in Somalia. Like many other Somalis, war forced his family out of Mogadishu to New York and later to Canada. His aunt Magool was purportedly a great Somali singer and his grandfather was a poet. He was born into a family of artists but I forgot about K’naan after the World Cup theme song Waving Flag died down. What got me interested in Somali poetry again and the more was Warsan Shire’s winning of this year’s inaugural Brunel Poetry Prize for African poetry. Her winning entries took my breath away and at the same time, reminded me of what I felt about Somalia during the World Cup. Somalia has art. I haven’t discovered enough of it yet but certainly Somalia has art. Much of it is shrouded in Arabic but for the few who have shared their art with English, the distinction is clear. What is happening in Somalia is deep consciousness and a protest movement that is silently but effectively carrying freedom messages across to the oppressors in the country, generation after generation, both in performance poetry of an ancient oral tradition that predates modernity, and written word. Read any Somali poet and you will read protest. Just like those poems of the 50s and 60s and 70s that spread across much of Western and Eastern Africa against oppressive regimes. There have been a few stand-out poets that I will err by not mentioning. The greatest-living Somali poet is called ‘Hadraawi’ (real name Mohamed Ibrahim Warsame). He has been called The Somali Shakespeare in many places and reading a few of his works have made me see why. I hope to review one of his poems soon but in the meantime, read this one titled Has Love been Blood-Written. I’m not reproducing it on this post because of its length. The next poet you should definitely know is ‘Gaarriye’ (real name Maxamed Xaashi Dhamac). I will have to thank my new-found Somali poet and blogger friend, Dahaba for introducing Gaarriye to me. From her blog, read this poem by Gaarriye titled Arrogance. Unfortunately, Gaarriye died in a Norwegian hospital in September last year at 64 years. I am looking for his world-acclaimed poem titled “Hagarlaawe” (The Charitable) and perhaps I will attempt a review of it too if it’s not too long. Finally, follow Warsan Shire’s works, who was just a few weeks ago made the first Young Poet Laureate of the city of London; the Somali winner of the Brunel Poetry Prize, yes that Warsan! I will leave you with this short farewell poem written by Somali poet, Sufi Sheikh, and anti-colonial warrior Sayyid Mahammed ‘Abdille Hassan for a departing friend in the 19th Century and originally shared in a beautiful article on this same topic written by Rahma Bavelaar. Between your body and the assailant sun. This article has been somewhat long and thank you for tarrying to the end of it. From the time you have read it, I hope I have lit a little flame in your poetic heart that will make you henceforth see Somalia as a country alive with art and heart, irrespective of what economics and politics tell us about it. There is a country alive in the east. Her name is Somalia. The $3,000 Brunel University African Poetry Prize is awarded to an African poet for a selection of poems. The prize which is now in its second year and is sponsored by Brunel University and partnered by Commonwealth Writers is aimed at the development, celebration and promotion of poems from Africa. The prize is currently open for entries and will close on November 30th. The winner will be announced on 28th April, 2014. For more information on the Brunel University African Poetry Prize, visit their website: http://www.africanpoetryprize.org/. I had one good day yesterday. 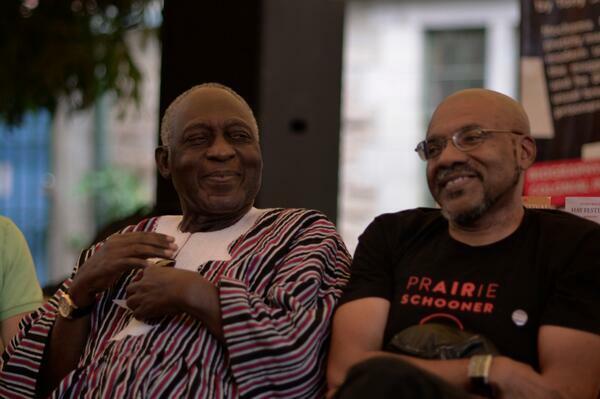 Prof. Kwame Dawes, a Ghanaian-Jamaican poet who was with Kofi Awoonor at Storymoja Hay festival where Awoonor was killed, passed through Ghana for the funeral. Afterwards, he asked to meet the literati in Accra to confer on this and that. It was a good gathering attended by bright lights like Ama Ata Aidoo (@AmaAtaAidoo), Nii Ayikwei Parkes (@BlueBirdTail), Esi Sutherland, Kwame Dawes (@kwamedawes) himself and the creme of the Department of English of the University of Ghana. I felt privileged to be in the company of such great advocates and proponents for the African literary voice and the hour and half felt like very good investment for the 73km I had journeyed to get to the venue. Prof. Dawes was making his point for the African Poetry Book Fund, the Sillerman Prize and other possible activities that could be put together to push African literature through the university system and partnerships with the Univeristy of Nebraska. It was refreshing. There were mentions of Awoonor, who had been the reason why this meeting had been at all possible and I was elated that when I got up to speak and introduced myself, Ama Ata Aidoo recognized my name. She later mentioned how Kinna had read to her my previous post in tribute to Awoonor. There was suppressed laughter after the event, masking our general elation for being able to keep the conversation on African literature going, while also having to privately mourn, as a community of literature lovers, one of the best poets of African extraction. I joked with Prof Dawes at how he and the judging panel of the Brunel poetry prize could not see the brilliance of the entries I submitted. Warsan Shire totally deserved that award, let it be said. Of the feet that strayed this way just yesterday. Why do we kneel here? We can make here no penance or sacrifice. Our teeth and all their teeth set on edge. While tears lick our faces dry. Ready to disappear into the dirges of our dreams? This is no more word on the street.